Am I a good candidate for tubal ligation? Are there any reasons why I shouldn't have a tubal ligation? What are the risks of tubal ligation? What are the benefits of tubal ligation? What should I expect on the day of my laparoscopic tubal ligation? Are there any warning signs I should look out for after the surgery? Tubal ligation is a surgical form of sterilization. It is a permanent form of birth control. During the surgery, the fallopian tubes are blocked; this can be done by tying, sealing, or attaching a ring or clip to them. This procedure can be performed postpartum (at time of cesarean section or within 48 hours after vaginal delivery) or as an interval procedure (performed six weeks after delivery or at any time not related to pregnancy). Postpartum tubal ligation is performed through a small incision under the navel. Interval tubal ligation can be performed through a small bikini type incision or by a technique called laparoscopy. During laparoscopy, the doctor uses an instrument-like telescope, called a laparoscope, to look at the pelvic organs and to block the fallopian tubes. Tubal ligation permanently blocks the fallopian tubes so the egg cannot move down the tube and the sperm cannot reach the egg, therefore pregnancy cannot occur. Tubal ligation is 99.20 effective. If a woman does get pregnant after sterilization, there is a greater chance that it is a tubal pregnancy. Failure of the procedure is more likely if a woman is relatively young, because younger woman are more fertile than older women. Tubal ligation is ideal for those women who are certain they wish no further children and need a reliable contraceptive method. If you are considering tubal ligation, you and your partner should discuss vasectomy, a sterilization procedure performed on men. Compared to female sterilization, vasectomy is simpler, safer, less expensive, and more (99.9%) effective. It is performed under local anesthesia by a urologist. Although in some cases tubal ligation can be reversed, it is a difficult and expensive operation not covered by health insurance. Afterwards there is a greater risk of ectopic pregnancy. Tubal ligation, in general, is an elective procedure and should be delayed if there is any uncertainty. Laparoscopic tubal ligation is not right for all women. If you have had prior abdominal surgery, are very overweight, or have medical or gynecologic problems, a larger incision and hospital stay may be required. Laparoscopic sterilization rarely has any major complications. Serious complications, such as infections, bowel injuries, bleeding, burns, or complications from anesthesia, occur in about 1 in every 1,000 women who have the operation. Pregnancy can occur after surgical sterilization, but the risk is very low. Less than 1% of women who have the procedure will ever become pregnant. Those women who do get pregnant after sterilization are more likely to have a tubal pregnancy. * The final decision is between you and your doctor. The operation takes place in an outpatient surgical suite. Consent for the surgical procedure will be obtained by your doctor. When you sign this you are stating that you understand the risks and benefits of the operation itself, understand that the procedure is NOT 100% effective for birth control, and that you are aware of appropriate alternatives. An intravenous line will be started to give you fluids during the operation. General anesthesia is necessary for the laparoscopic procedure, so you will be asleep during the operation. After anesthesia is given, a small incision about half an inch long is made in the skin just below the navel. Carbon dioxide is used to swell the abdomen so the pelvic reproductive organs can be seen more clearly. The laparoscope is inserted into the abdomen through the incision. This instrument has a bright light and lens like a tiny telescope that allows the surgeon to see into the abdomen. A second instrument is inserted either through the laparoscope or through a small second incision made near the pubic hairline. 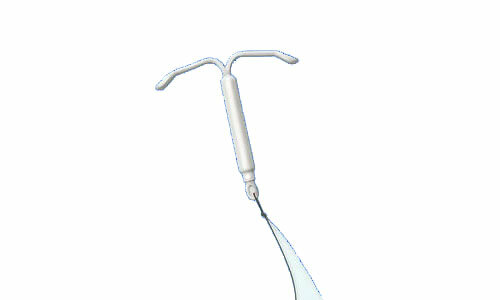 The fallopian tubes are grasped and sealed by using bands, clips, or electrocoagulation (electricity). With electrocoagulation, an electric current is used to burn and block the tubes. After the procedure, the instruments are removed and the gas is released. The incisions are then closed. You will be observed for a short time to be sure that everything is all right. Most women are ready to go home 2-4 hours after the procedure. The incision should be treated as an ordinary skin cut and kept dry for a few days to promote good healing. A bruise around the incision, if present, will soon fade away. If the incision appears infected or if the tenderness lasts longer than a few days, your doctor should check to make sure there is no infection. After the incision has healed, a slight scar will remain. A postoperative check-up will be scheduled for two weeks after the operation.